Following a six-month study of naked mole-rats, scientists have surprisingly come up with a forecast for the future of humanity. Russian scientists studying naked mole-rats believe that evolution might cause human aging mechanisms to slow down significantly, but this will happen only millions of years from now. Naked mole-rats (Heterocephalus glaber) have very little in common with humans. Found in East Africa - in Kenya, Ethiopia, and Somalia - naked mole-rats appear similar to mice, but they live an incredible 10 times longer, for 30 years or more, which is a stupendous longevity. Nevertheless, following a six-month study of naked mole-rats, researchers at the Belozersky Institute of Physico-Chemical Biology of the Moscow State University have surprisingly come up with a forecast for the future of humanity. Naked mole-rats are not prone to age-related illnesses, and remain alert and active throughout their entire life. Why is this so? The Russian scientists found a link between this specie’s slowing body development and the fact that its body has no aging mechanisms. It’s believed that humans will evolve along this same pattern in the future. The researchers found that humans and naked mole-rats share a set of similar body development signs, and it’s possible that the two species have been developing along similar paths. Like with naked mole-rats, an important indication of maturity in humans is how long it takes for the brain to develop. For example, brain reactions demonstrated by one-year-old chimpanzees do not become apparent in humans until they turn five. It took naked mole-rats tens of millions of years to evolve and slow down the aging process. Humans only started along this path between 100,000 and 200,000 years ago, and it will take us several more million years to completely deactivate our aging mechanisms. It’s impossible to speed up evolution, but scientists are seeking ways to somehow slow down the aging process with the use of pharmaceutical drugs what would isolate free radicals. Moscow State University has been researching such drugs for the past decade, and they’re now undergoing clinical tests on humans. Researchers noted that naked mole-rats managed to slow down the evolutionary processes and bypass natural selection. Their bodies contain much fewer mobile genetic elements than other mammals. Naked mole-rats have no need for adapting to the changing environment, and so they have virtually stopped evolving. The scientists identified 43 signs of neoteny, or slowing body development, in naked mole-rats. These include underdeveloped lungs, a huge head, and thermoregulation problems (the temperature inside the lab must be kept at +28°C or above at all times). The animals have no fur coat and throughout their life they look like newborn baby rats. Pregnancy in naked mole-rats takes around 90 days, which is rather long. Only the queen and her male partners are reproductively active; the rest of the colony serve and protect them by digging tunnels and raising their offspring, without reproducing themselves. Should the queen die, another female in the clan will assume her role. Mole-rats owe their ’eternal youth’ to the unusual properties of their mitochondria, which play a decisive role in aging. Mitochondria help living organisms breathe, but they also accumulate toxic free radicals, which trigger the aging processes. The mitochondria found in naked mole-rats' heart and liver cells are amazingly resistant to free radicals. Concentrations that would kill cells in any other animal have no effect whatsoever on these animals. Just like in newborn mammals, the rate at which oxygen concentration levels decline in naked mole-rats' mitochondria is minimal. The largest lab colony of naked mole-rats, comprising over 2,000 animals, is at the University of Texas. 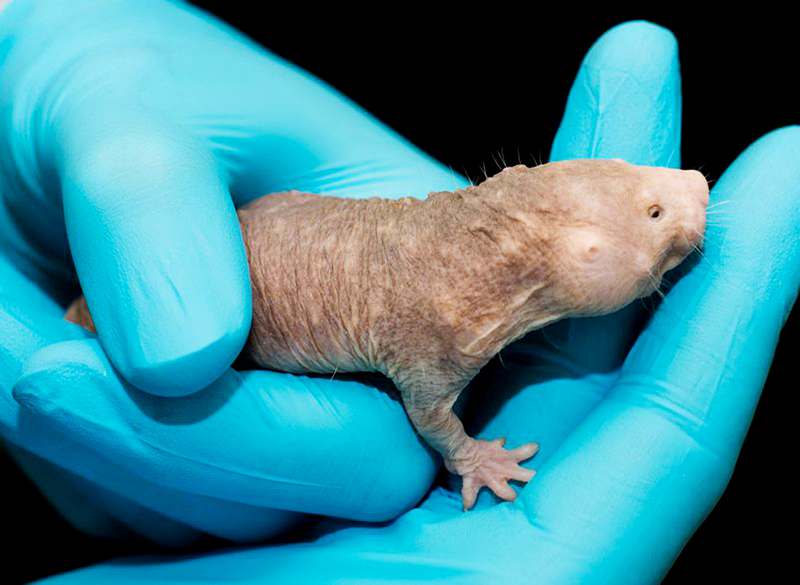 There are about a dozen labs studying this species around the world, and the naked mole-rats at Moscow State University were gifted by the Berlin Zoological Garden. This first such colony in Russia can be watched online.